It’s been a running discussion as to whether motion capture performances should be nominated for Oscars and other awards. That debate got ever louder when we saw the intense, emotionally wrenching performance from Andy Serkis as Caesar in “War for the Planet of the Apes,” the third and final of the series. Serkis didn’t get nominated for an acting Oscar this year, but who did was Joe Letteri for Best Achievement in Visual Effects. And while the performance we see on the screen is all Serkis, it was Letteri and his team who were responsible for making sure Caesar reflected all the subtleties and gestures offered up by the actor. So if you look into the eyes of the “Planet of the Apes” character Bad Ape and see a bit of Gollum, it’s because Letteri was one of the key players behind both mocap characters performed by Serkis. And looking at eyes in particular helped Letteri and his team at Weta Digital capture the realism director Matt Reeves’s film demanded. “It’s the really small movements that show you the performance. Especially around the eyes, that fine skin around the eyes and eyelids,” Letteri said. The three “Apes” movies all won the top award at the Visual Effects Society’s VES Awards, and the latest film even won four different VES Awards earlier this month. But the first two “Apes” movies lost the VFX Oscar to “Hugo” and “Interstellar.” It’s an amazing snub considering the groundbreaking work Weta Digital has done on all three films. And Letteri stressed that animating these apes has been no easy task. Letteri would devote countless hours watching Serkis’ performance side-by-side with what they were seeing from Caesar. Reeves conveyed so much of the film through long, sobering close-ups, and it was important that everything Serkis was giving was the same as what they were interpreting for the screen. All told, Letteri said “War for the Planet of the Apes” has little more than 15-20 shots that weren’t in some way digitally enhanced. Beyond even the realism of the apes, Weta Digital designed remarkably sophisticated models to create the forest devastated by an avalanche at the end of the film. They developed custom software and then simulated how a complete forest might grow over the course of 100 years, all within their digital landscape. “I don’t sculpt, I don’t paint, I don’t do any of those things you would typically think of that are models to get into filmmaking. The only thing I was interested in is how do I make the picture,” Letteri said. Given all that is possible, it begs the question why a film like “War for the Planet of the Apes” needs actors at all. But Letteri said real life people are still fundamental to the work they do. Watch a clip from the Q&A Thursday above. With "War for the Planet of the Apes," we're nine movies deep in a franchise that is just under 50 years old, making it a staple of pop culture for even longer than "Star Wars." And to celebrate its shockingly long lifespan and the release of a new entry, we're going to rank all the "Planet of the Apes" movies. Tim Burton's attempt at a franchise reboot is not really the total disaster we kind of collectively think it is now, but it is two hours of "I'm not sure why this exists." It's a weird reinterpretation of the original with a couple new twists that are there for the sake of having twists -- and neither are satisfying. That ape makeup work is something else, though. 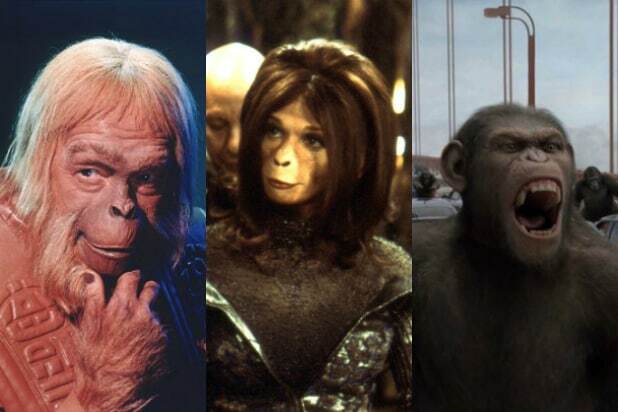 Every single one of the original "Apes" movies will always hold a special place in my heart, but the ever-decreasing budgets on these movies really took its toll by the time filmmakers got to the fifth one. For those of us who live in Los Angeles, we greatly appreciate "Conquest" for the sequence in which Caesar leads his ape uprising through Century City. On the other hand, they simply did not have the money to make said ape uprising as awesome and epic as we would have wanted. Every individual element of "War" is great, but they never really congeal into a coherent whole, frustratingly. The multiple subtle nods to the originals are a nice touch, though. Charlton Heston's reduced role in the first "Apes" sequel leaves it feeling a bit disjointed, but the thing is absolutely hypnotic anyway. It's a marvelously weird experience. There's really no reason to think that this reboot -- which amounts largely to James Franco raising his ape son for two hours -- would be as substantial as it is. And yet every time I watch it I'm shocked by just how excellent it really is. What can I say about the original classic that hasn't already been said? It's the standard by which we judge so many modern things. You'd think "Cornelius and Zira hang out with humans in the '70s" would be a jump-the-shark creative choice (and probably many people do hold that opinion), but for my money "Escape" is easily the most delightful entry in the entire franchise. As much as I love the "Apes" franchise, I would never have considered calling any of these movies perfect before I saw "Dawn." That's not to say I think "Dawn" is a perfect movie, but I do consider the possibility with surprising regularity.